Above is the result of this tutorial. 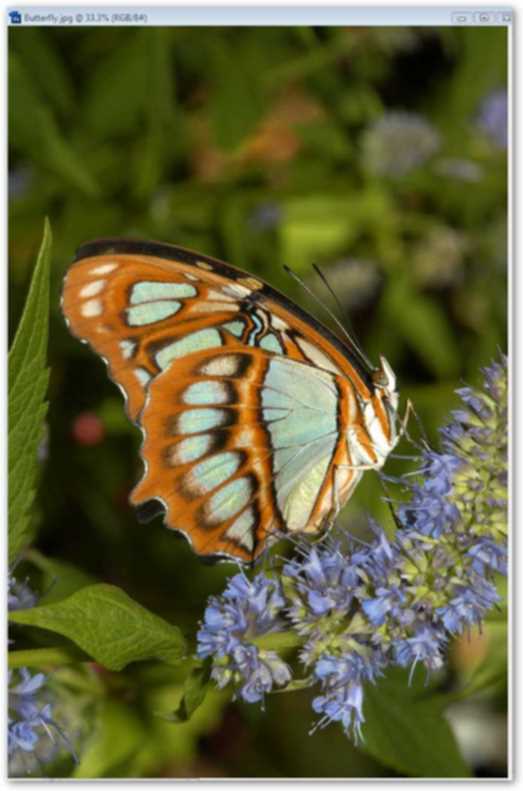 Here’s an image of a butterfly that I had taken a while back. I like the way the butterfly came out but I’m not happy with the rest of the image. The leaf on the left keeps catching my eye and the overall feel of the image is just too busy. Time to make some changes: The first thing I do is to bring the image into Photoshop. Here I’ll select the butterfly and the flower that the butterfly is on. 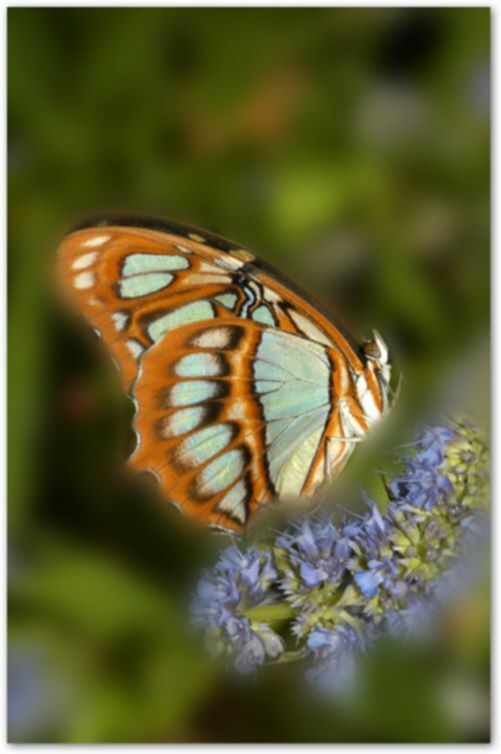 The reason I’ll keep the flower in focus too, is that the flower is in the same depth of field as the butterfly. If I should blur the flower too, the image will have an unnatural look. You don’t want your photo to look like it was worked on. So, keep in mind your depth of field. On your keyboard hit Ctrl+J. This will make a copy of your image. 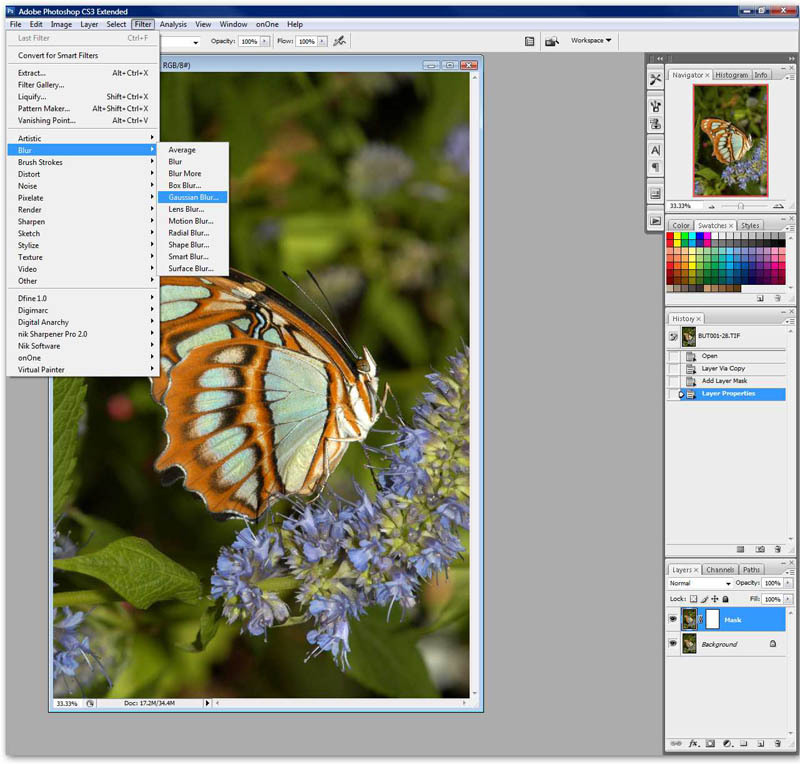 You want to make a copy of the original image so that you can add a layer mask to it. This is where you’ll be doing all of your work: Make sure the copy “layer 1” is selected. The layer should be highlighted in blue. 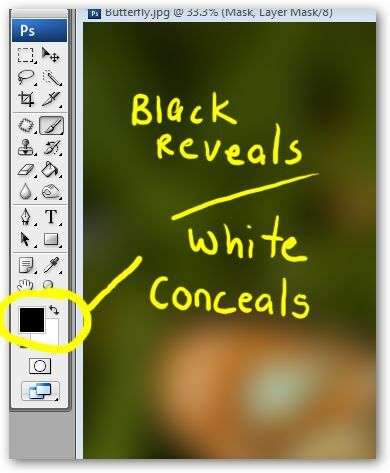 Click on the layer mask icon at the bottom of your layers palette: I always label my layers because if you work on a project and have a lot of layers it can get very confusing which layer belongs to what. So, I’ve made it a habit, even though this project will only require one. 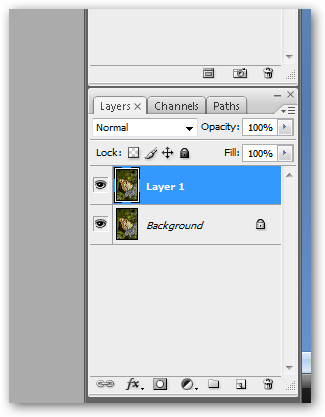 To rename the layer you double click the word “Layer 1” in the layer copy. You’ll see a box appear around the word “Layer 1”. Then type in what works for you. I’m going to type in the word “Mask”: Now you’re ready to start working. 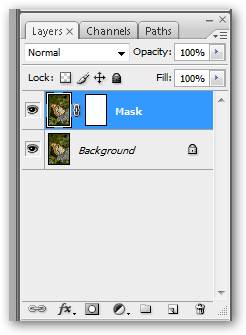 In the mask layer make sure that the picture on the layer is selected just by clicking on it once. You do this because this is the layer you want to blur. The next thing you do is go to the Filter menu on the tool bar at the top of your screen. 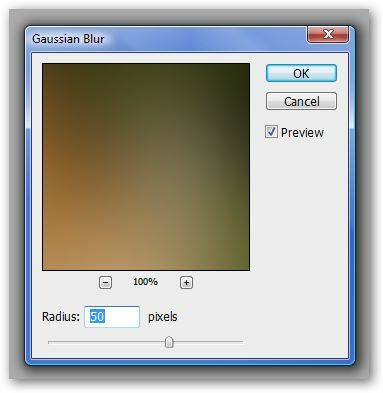 Click Filter, Blur, Gaussian Blur: Here is where the Gaussian Blur dialog box will open up. 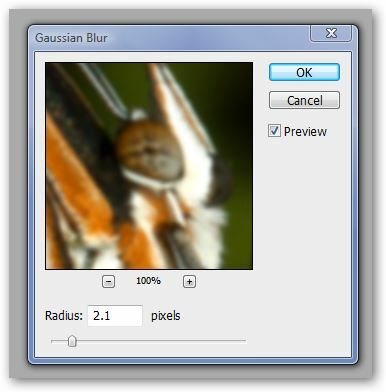 For the image you’re working on you’ll have to decide how much of a blur you want. Play with the radius slider. The smaller the number the less of a blur you’ll get. The higher the number the stronger the blur effect will be. See the difference between 2.1 and 50. There’s a huge difference. Usually I don’t go higher than 10, but in this case I think I’ll go with a high blur to just get rid of all of the distractions: When you’ve decided how much blur you want, click OK. 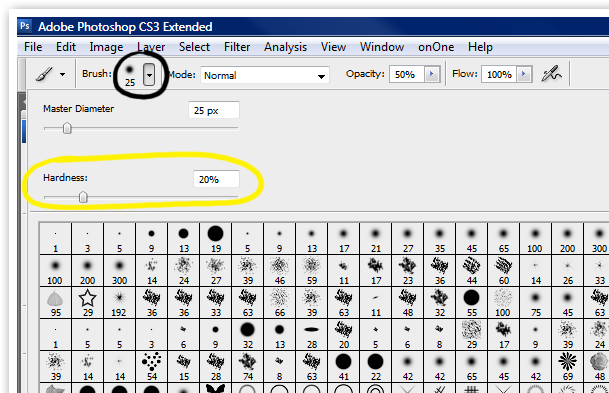 Here is where the layer mask comes in. 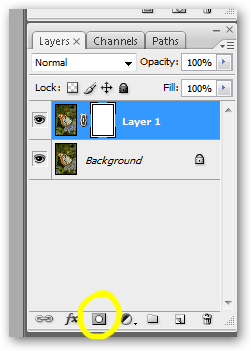 On the layer, make sure that you click on the mask that’s the white box in the layer mask layer. Just click it once to make it active. You can see when it becomes active, it gets a little border frame around it. The next thing you’ll do is select a paint brush. 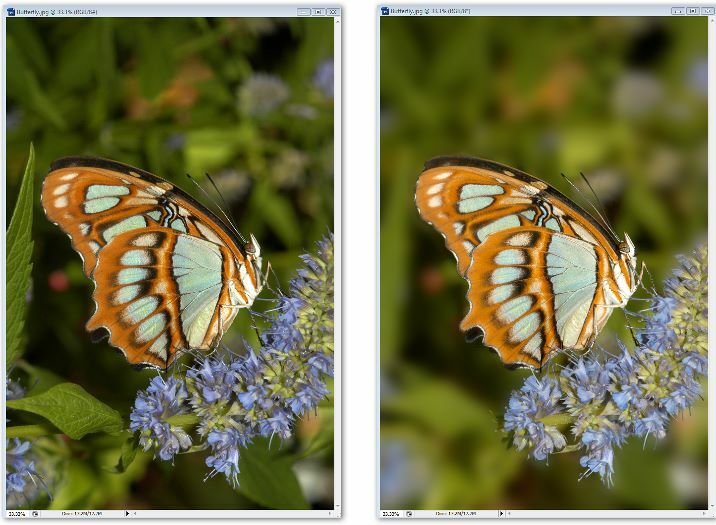 Go to the tools palette and select a brush: To bring back the butterfly through the blur you’ll have to paint it back. Before I start painting the butterfly back I make sure that the foreground color is black, and the background color is white: Start painting with the brush. You’ll see the image underneath come out. Do this slowly and with an opacity of about 50. You can make the opacity stronger when you work on the center of the object, but working on the edges I’d use less of an opacity to blend it into the background. Make sure the brush itself is at an opacity of about 20%: Here is the work in progress: Here are the before and after images: Try it for yourself and have fun. it made a huge difference in my pictures! thank you for such an awesome website!! !